In the immortal words of Cookie Monster "Me Love Cookies!" Cookies are a girl's best friend! My Name is Darlene. I am a cookieaholic. Cookies are the way to my heart! I want to win it because I eats it! Because I've lost 13 lbs (on purpose) in the past few months, and there would be no better way to put them back on than a box of tasty, evil, seductive cookies. Snicker as you sock me with goats. Skipped breakfast. Now hungry. Give me Liz Lovely cookies. Please. Happy wife equals happy life. I need this. I am in need of some deliciousness in my life. To prove they should be called "Bakies" instead of "Cookies!" Umm, because I rolled a zero on my "Resist Cookie" save? How will I know if they are better than mine if I don't win? Am I winning? Am I even close? Because those macaroonies make my bits tingle. Also, I'm vegan! I need something to eat in front of the TV. To help refill my blood supply - it's mosquito season. It's the end of the world as we know it, and I feel like I need a cookie. p.s. are we allowed to enter more than once? p.p.s. Please disregard last post - it was longer than 10 words. p.p.p.s. You are my favorite. In my native land of Cookiestan, this making me rich! OMG. It's deadline. This was fun! Thanks all for participating in C. Nerd's first ever giveaway. 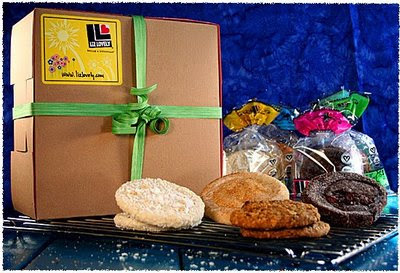 Picking a winner was difficult-Cakespy, would of loved to see L L's cookies illustrated in your quirky style--too bad you used too many words! Darlene--hilarious! Anxiously anticipating the next contest! It was fun! HaHa. Hilarious. I live in the neighboring village of Cakeistan.